Imagine this…I (Lizzie) am up a tree, hiding on the edge of a river bank, camera in hand, poking through the foliage. A 100 yards down stream, having befriended a random guy doing a spot of fishing, Tom is sitting in plain view on the river bank, hood up, sunglasses on pretending to be a fellow fisherman! He actually looked more like a member of the mafia but never mind. We sat waiting for the object of our attention to arrive. David had secretly arranged for us to capture the moment that he would ask Lianne to marry him. A real engagement shoot! So up for that! 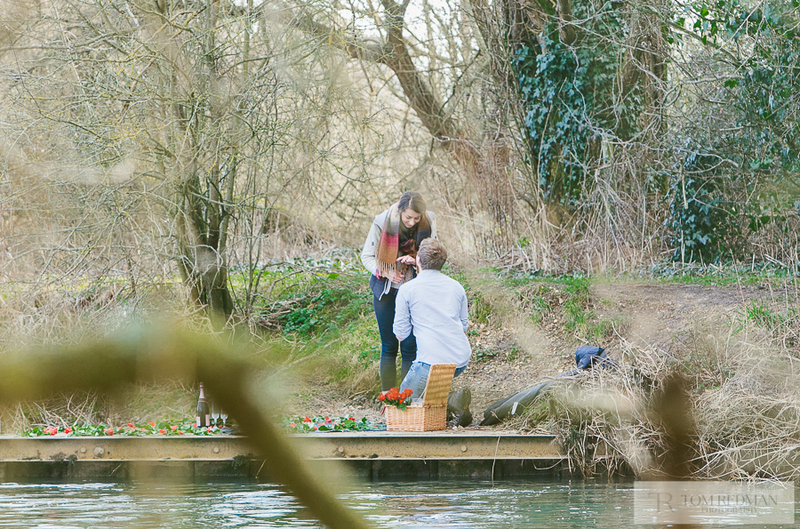 David had devised a plan where by Lianne's mum and sister would sneakily set up a blanket with roses and champagne in a beautiful spot on the river at Throop Mill, a place special to both of them. The sun was out and everything was set. We waited and waited a bit more, listening to the gentle lapping of the water and the birds tweeting away. After about 20 minutes, we had notification that they were on their their way and as David and Lianne came in to view and made their way down the path past us, my excellent hiding skills and camouflage cover was nearly blown by my phone loudly strumming out it's guitar tone! I am usually so good at switching it on silent…but not today! 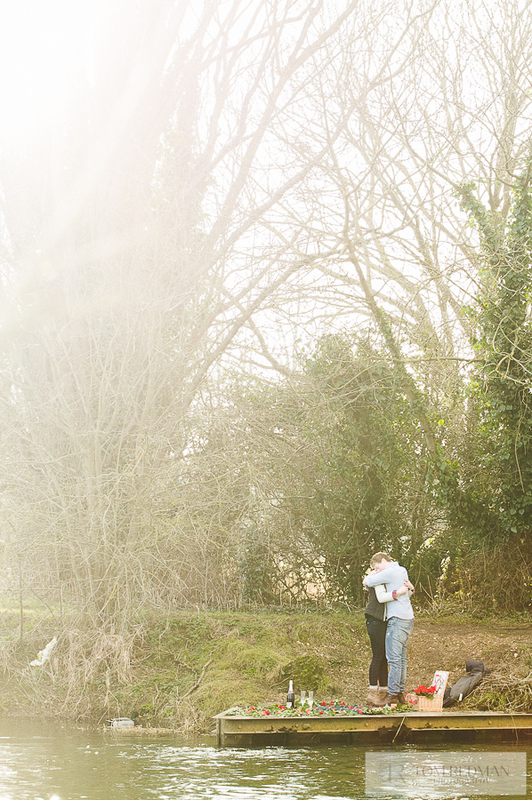 I scrambled to turn it off, nearly dropping my camera in the river below me and missing the popping of the question! Seriously. Thankfully, it went completely unnoticed and was not enough to spoil was was the most perfect proposal. And to all of the spectators delight, Lianne said YES! They are the most gorgeous, young, lovely couple and we are so so excited for them and all that there is to come! Congratulations Lianne and David. What an awesome day! This is where all the fun begins!